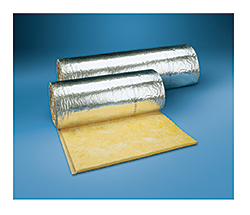 WideWrap™ is used to insulate rectangular and round HVAC ductwork. The blanket-type insulation is composed of glass fibers bonded with a thermosetting resin and is available in 5-foot lengths. The insulation provides thermal efficiency that reduces unwanted heat loss or gain from equipment and ductwork, and it almost eliminates condensation problems on cold duct surfaces.